Th17 cells were the first T helper cells identified 25 years after Th1/Th2 cells with the finding of IL-17. Research found this T cell group to be involved in the pathogenesis of autoimmune disease along with clearance of extracellular bacteria and fungi. Formation of Th17 was first found to be triggered by IL-23. For Th17, the development of the cells is much more complicated and dependent on the environment. Mucosal tissues such as the intestine have emerged as a key location for the regulation of Th17 cells. An increase in Th17 cells happens with environmental changes to the microbiome and the diet. The intestinal mucosa maintains a delicate balance between regulatory and effector T cells. This leads to a dynamic changing process where naïve T helper cells can be induced to form Th17, Treg, Th22, or Th1 cells. When this system is imbalanced to pathological Th17 cells, there is an increase in tissue destruction in autoimmune disease separate from the effects of Th1 cells. 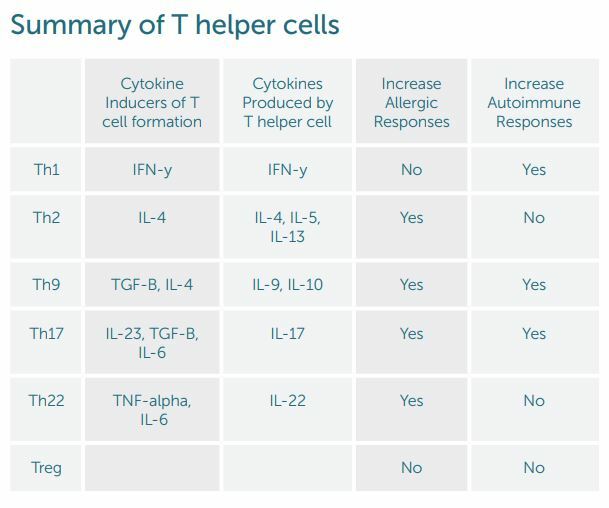 T helper 9 cells are the primary producer of Il-9. They can differentiate from naive CD4 helper cells from induction from TGF-B and IL-4 or from Th2 cells. These Th9 cells can also be induced in different amounts depending on environmental influences and cytokines released from other T helper cells. In the same manner as Th17 cell development, the differentiation into Th9 cells appears to be fluid. Il-9 appears to be a mediator of inflammation and play a key role in allergic diseases. A recent T helper subset that has been identified is the Th22 cell. IL-22 can be produced by Th1 and Th2 cells but Th22 appears to be a unique subset with specific chemokine receptors. Unlike Th1 and Th17, the Th22 cells cannot make Il-17 and IFN-gamma which is the reason they have been designated as a distinct subtype. These cells are induced by TNF-alpha and Il-6 and inhibited by TGF-beta. They appear to be similar to Th17 because of their ability to be pro-inflammatory and protective to tissues. When protective, Th22 helps protect epithelial cells and supports wound healing. When dysregulated, Th22 can exacerbate eczema. T regulatory or T suppressor cells modulate adaptive and innate immunity. Their role is to control systemic and tissue-specific autoimmunity. It is important for the immune system to have a way to limit inflammatory responses so they do not become chronic or imbalanced. Multiple subtypes of T regulatory cells exist. Mutations in the genes that mark a specific type of Treg cell can increase allergic disorders such as eczema and autoimmune diseases. T cell plasticity: What T helper cell shall I become? Original thought with T helper cells was a terminal differentiation to one type of cell. Now it appears as if T cells can respond to different cytokines telling them to take on distinct roles in the immune system. Hybrids of Th1/Th2 cells have been found during parasite infection. Depending on what the immune system needs to combat the infection, the hybrid subset can go toward either a Th1 or Th2 group. The development of Th17 can end up in multiple types of T cells from Th1 to Th22. Its production can be either pro or anti-inflammatory to tissues. Having a fluid dynamic development of T helper cells is beneficial allowing the body to try and maintain a homeostasis in the immune system. Chronic allergic and autoimmune illness arise from a dysregulated differentiation of helper T cells. This dysregulation disrupts homeostasis of the immune system. Different environmental factors such as the microbiome and the diet can alter this homeostasis. The good news is that T helper cells are plastic in their development. If T helper cells can change their path, we can alter the course of allergies and autoimmune diseases. Different cytokines transmit information to t helper cells to instruct them to track towards a pro-inflammatory or anti-inflammatory role. Natural compounds such as curcumin, resveratrol, and EGCG in tea have been shown to alter cytokine levels. Environmental changes such as nutritious food and healthy probiotic bacteria can also play a role in regulating T cells away from inflammatory cytokine formation. With the rise in allergic and autoimmune diseases, we need to understand potential pathways for T helper cells to steer them toward a regulated protective role instead of a pro-inflammatory state. 2. Balajii C. Et al. Long-term persistence of inflammation in children vaccinated with salmonella conjugate vaccine is associated with augmented Th9-Th17 cytokines. 5. Berker M Et. al. Allergies: A T cell perspective in the era beyond the Th1-Th2 paradigm. Clinical Immunology. 2017. 174:73-83.
and autoimmunity. J Clin Invest. 2015 Jun 1; 125(6): 2211–2219. 7. DeBacquer D. Et al. Epidemiological evidence for an association between habitual tea consumption and markers of chronic inflammation. Atherosclerosis. 2006 Dec;189(2):428-35. 9. Dominiak K. Et al. Critical need for clinical trials: an example of a pilot human intervention trial of a mixture of natural agents protecting lymphocytes against TNF-alpha induced activation of NF-kB. Pharm Res. 2010 June;27(6). 10. Ghanim H. Et al. A resveratrol and polyphenol presparations suppresses oxidative and inflammation stress response to a high-fat, high-carbohydrate meal. J Clin Endocrinol Metab. 2011 May;96(5):1409-14. 11. Jager A. Et al. Th1, Th17 and Th9 effector cells induce experimental autoimmune encephalomyelitis with different pathological phenotypes. J Immunol. 2009 December 1; 183(11): 7169–7177. 12. Maeda S. Et al. The Various Roles of Th17 cells and Th17-related Cytokines in Pathophysiology of Autoimmune Arthritis and Allied Conditions. J Clin Cell Immunol. 2013, S10. 14. Waite J. Et al. Th17 Response and Inflammatory Autoimmune Diseases. Int J of Inflamm. 2012. Article ID 819467.